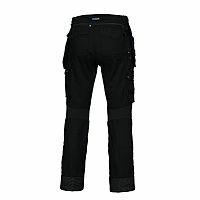 Projob Canvas Work Trousers with tool pockets. 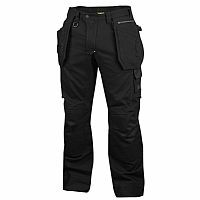 Roomy hanging pockets with extra compartments and internal cordura reinforcement. Front pocket where hanging pockets can be stowed. Back pockets with reinforced inside, flap on left one. 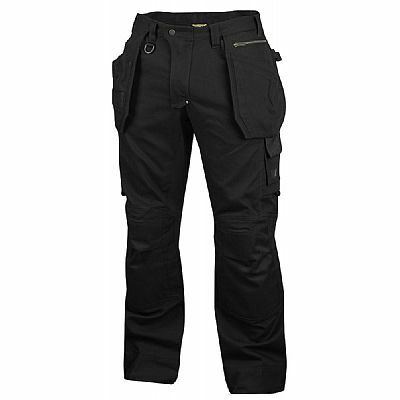 Reinforced front folding rule pocket, detachable at bottom, pen pockets and knife button. Leg pocket with mobile compartment. Padded yoke for optimum comfort. Pre-bent knee with kevlar kneepad pockets. 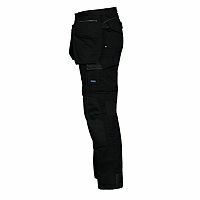 The kneepad pockets have two height levels.